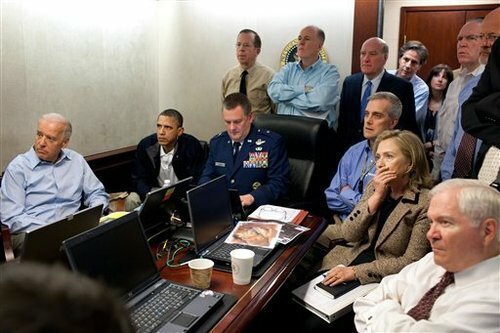 In addition to images of President Obama’s address to the American public on Sunday night, it has emerged that the dramatic photos of Obama, Biden, Hillary Clinton and members of the White House security team watching the assassination of Bin Laden “live” were in fact completely staged, casting further doubt on the ever-changing official account of the operation. In one particularly dramatic photo, Hillary Clinton is seen with her hand anxiously clasped over her mouth as if reacting to a crucial event. Other photos show Obama and his staff with stern faces as they discuss the operation while it unfolds. The photos were described by many as having “historical significance,” forming a “captivating” record of Obama’s greatest success and being the “defining moment” of his Presidency. “US president Barack Obama along with his high-level team, watched live coverage in the White House, as the commandos gunned down the world’s most wanted terrorist Osama Bin Laden Via a video camera fixed to the helmet of a US Navy Seal,” it was also reported. US chief counter-terrorism advisor John Brennan claimed that the head cameras that fed audio and video back to the White House, allowed Obama and his staff to track the operation “on an ongoing basis”. But the claims have been proven to be completely fraudulent. it has emerged that Obama, Clinton and their staff saw virtually nothing whatsoever of the mission that allegedly led to the assassination of Bin Laden, because according to CIA director Leon Panetta, there was a 25 minute blackout of the live feed which was cut off before the US Navy SEALS even entered the building. “A photograph released by the White House appeared to show the President and his aides in the situation room watching the action as it unfolded. In fact they had little knowledge of what was happening in the compound,” reports the London Telegraph. The notion that Obama “saw the terror chief shot in the left eye” live on video is a total fabrication. At best, the photos were cynically misrepresented by the White House and the mainstream media, at worst, they were completely staged to add a contrived dramatic spin to the unfolding wall-to-wall press coverage of the Bin Laden fable, which is becoming more convoluted with each passing day. The key image that clearly indicates the photos were staged is the shot of Hillary Clinton with her hand over her mouth. Clinton looks shocked as if she has witnessed something disturbing, obviously implying that she is watching a live shootout or someone being assassinated, when in fact she saw nothing of the kind because the feed was cut before the SEALS entered the compound. The White House was careful to not describe this image as representing the moments during which the SEALS stormed the building, but the implication was clear, and the establishment media did the work for them, reporting that the picture depicted Obama and Clinton, “watching intently as the raid takes place,” another total falsehood. Former top spymaster Dr. Steve R. Pieczenik, a man who worked under five different US Presidents, has been proven correct in his assertion that the photos were “Nonsense….total make-up, make believe,” and proof that Americans were being held captive to a “theater of the absurd”. We truly have entered the “theater of the absurd” when, even as the narrative of the Bin Laden fable crashes and burns, the establishment media that helped manufacture this work of fiction are still claiming that anyone who even questions the blaring inconsistencies of the official account are merely conspiracy theorists engaging in “black helicopter fantasies”.